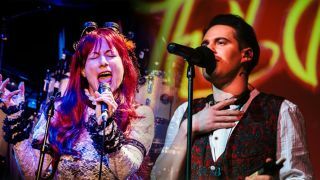 That Joe Payne and Doris Brendel have announced a mini-UK tour for 2019. They’ll share the stage with their bands for three double-headline shows, which will take place in March and April. The live shows will be Payne’s first official tour since he left The Enid in 2016, while Brendel will deliver a full set after a year of supporting Fish and Wishbone Ash. Former Touchstone vocalist Kim Seviour was originally scheduled for the tour, but had to take a step back due to health reasons. Payne explains: “I totally understand Kim’s reasons for dropping out of the tour. I’ve been there myself in the past, and sometimes we have to put our health first. Brendel, who will showcase her latest solo material on the tour, adds: “After spending three months touring with Fish with huge stages and venues, we’re particularly looking forward to seeing the whites of people’s eyes in a more intimate setting. Payne will perform tracks from his new seven-track EP What Is The World Coming To, which was released back in October. Tickets for the shows are available through Payne’s website. It’s also been announced that Payne will play an acoustic set at the Marillion Weekend 2019 at Port Zelande, Netherlands, on March 23. He’ll also play a set at the Winter’s End Festival on April 7 alongside Hayley Griffiths as the guest vocalists for Zio – a new project founded by ex-Karnataka drummer Jimmy Pallagrosi.